Buster Brown Comes To Town! Buster Brown and his dog Tige in front of the Spruce Pine Store Company. 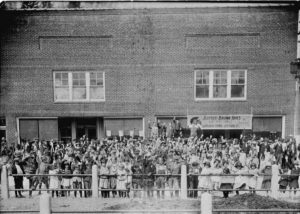 Turning out when a celebrity visits town has always been commonplace, and when Buster Brown and his dog Tige stopped by the new Spruce Pine Store building in the 1920s, the whole town turned out to say hello. 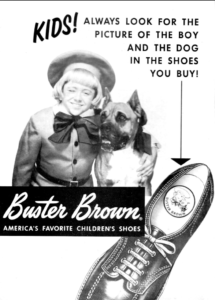 “I’m Buster Brown, and I live in a shoe. That’s my dog, Tige, and he lives there, too,” went the jingle for Buster Brown shoes. The Spruce Pine Store, owned by the Harris Mining Company, offered general merchandise and moved into this location in the early 1920s (now known as the Wylie Building). This picture was taken from lower street at the Spruce Pine Depot. Buster Brown and Tige can be seen to the left of the Spruce Pine Store banner.